The Daikin Emura FTXJ50MS has an silver front fascia fitted to the indoor unit giving the indoor unit a sleek and elegant design. 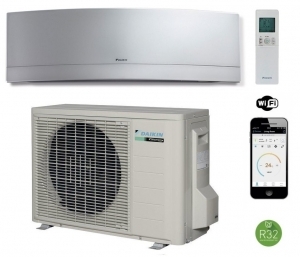 This system offers an efficient way of heating and cooling for year round comfort. This model can control temperature in rooms up to 50 square meters in size. The intelligent control of the indoor unit monitors movement in the room and alters its running mode to switch to economy running mode when no human movement is sensed, hence giving you maximum energy efficiency. The system also includes Wi-Fi control.